Tamil Nadu Public Service Commission will be taking the written exam for 49 Drug Inspector & Jr. Analysts. Applicants who have filled forms can download the TNPSC Syllabus 2019. Written Exam is going to be held on 23.06.2019 respectively. Before that, you can start up your preparation with the TNPSC Exam Syllabus 2019 for good scoring. This TNPSC Drugs Inspector Syllabus 2019 will help in the Drug Inspector & Jr. Analysts Exam. Candidates can check more relevant information related to Tamil Nadu PSC Exam Syllabus 2019 from the given below mentioned article. How To Download Subject Wise TNPSC Syllabus 2019? What Are The Important Date For TNPSC Examination 2018? Written Exam question paper will be based on 05 topics. Duration of Exam will be 03 hours. Maximum Marks of the Paper I will be 300 Marks. Time period of the exam will be 02 hours. Find out the TNPSC Syllabus 2019 Section. Take out the print of TNPSC Drugs Inspector Exam Syllabus 2019. 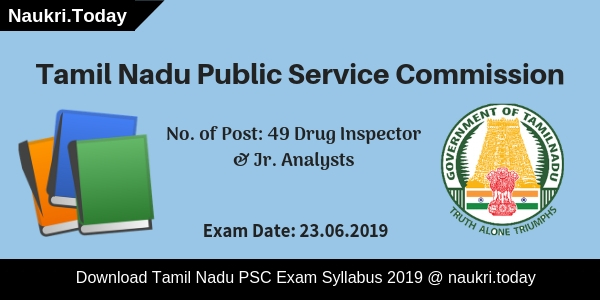 Conclusion: TNPSC Syllabus 2019 for 49 Drug Inspector & Jr. Analysts Exam on its official website. Applicants can download the subject wise TNPSC Drugs Inspector Exam Syllabus 2019 before the exam date which is 23.06.2019 respectively. Hello Friends, are you looking for TNPSC Syllabus 2019? If yes then this is the right place for you. Tamil Nadu Public Service Commission is going to take written examination for 580 Assistant Agricultural Officer Post. Participants can collect topics which are important from the examination point of view from here. For better preparation of exam candidates can download TNPSC AAO Syllabus 2019. Written exam for Assistant Agricultural Officer post will be held on 07.04.2019. For more details aspirants must read the given article carefully. Department will organize written exam for the participants who have applied online for Assistant Agricultural Officer Post. Examination will be objective type in nature. Written exam will consist of two papers i.e. Paper I & Paper II. Paper I will be of Agriculture subject & Paper II will be of general studies, Aptitude & Mental Ability test. TNPSC Exam will be total 500 Marks in which Paper I will contain 300 marks & Paper II contains 200 Marks. Time duration to complete Paper I will be given 03 hours & Paper II will be of 02 hours. Paper I & II will be held in two languages i.e. English & Tamil Language. Examination will be held in 07 centers. Conclusion: Tamil Nadu Public Service Commission will conduct written exam for 580 Assistant Agricultural Officer Post. Candidates who are appearing for AAO Exam can download TNPSC Syllabus 2019 from here. Written exam will held on 07.04.2019. TNPSC Syllabus 2019 – Tamil Nadu Public Service Commission is going to conduct written examination for 41 Assistant Engineer Posts. An examination is going to held on 2nd March 2019. Participating applicants may download TNPSC Exam Syllabus from here. Candidates should check here Exam pattern and selection criteria. It may help you to improve your performance level in an examination. Applicants may download TNPSC AE Syllabus 2019 from links given here. Tamil Nadu PSC Department will select candidates on the basis of three stages such as Paper I, Paper II, & Interview. The Department has written examination two parts such as Paper I and Paper II. A Paper I consists of subjective material and paper II contain General Knowledge, Mental ability or Quantitative Ability. Candidates who qualify in both papers will appear for Interview. Candidates may require TNPSC Syllabus for doing preparations for examination. Here we provided you the exam pattern for both papers. Participants may download TNPSC AE Syllabus 2018 from links given here. For further more information regarding Exam Pattern check below table carefully. An Examination is divided into two parts such as Paper I & Paper II. A Paper I should be subjective type in nature and Paper II is objective type in nature. Paper I Contain question related to their relevant engineering field. Paper II consists of question regarding General Knowledge, Mental Ability, and Quantitative Aptitude. Total Marks for both papers is 500 Marks and Time Duration is 5 hours. Qualifying applicants will participate in Interview which consists of 70 Marks. Applicants need to hold an engineering degree in the following streams. Candidates who are participating in the tnpsc examination may check here assistant engineer syllabus. Participants who want to perform well in the examination may check here topic wise TNPSC Exam Syllabus 2019. Here we provided you AE Syllabus in two Parts. Firstly, Paper I syllabus is given here. Candidates should read syllabus according to their field from which you belong to. Applicants may download TNPSC AE Syllabus 2019 either from here or from the official website. Mechanical operation and engineering materials. Chemical technology and renewable energy sources. Applicants who are going to participate in assistant engineer examination may follow these steps to download TNPSC AE Syllabus 2018. Candidates should log on to the official website of Tamil Nadu PSC i.e tnpsc.gov.in. Applicants may search for syllabus section at the homepage. Now read complete exam syllabus carefully. Participants may click on the download button to save it. Conclusion: Tamil Nadu Public Service Commission has published notification for 41 Assistant Engineer Vacancies. Now the department will be organized written examination for Assistant Engineer Posts. Candidates may check here TNPSC Syllabus and exam pattern before start preparing for an examination. Are you looking for TNPSC Syllabus 2018 for Draughtsman Posts? If yes, It is the perfect place for you. Tamil Nadu Public Service Commission will organize written examination for Draughtsman Posts. The Department will select candidates on the basis of written examination and oral test. A written examination will take place on 03.02.2018. Candidates should check here topic wise & subject with TNPSC Exam Syllabus 2018. Moreover, information such as how to download TNPSC Draughtsman Syllabus PDF? and other information mention on the below paragraph. Candidates must require to read a full article properly for more information regarding exam syllabus. Tamil Nadu Public Service Commission has published notification for filling up 53 Draughtsman Vacancies. Candidates should check eligibility criteria before applying. Online Registration for TNPSC Draughtsman Exam has started from 30.11.2018. The Last Date for Online Registration is 28.11.2018. Applicants should check here topic wise TNPSC Syllabus 2018 for Draughtsman Posts. It will help you in your preparations for examination. Candidates may do their studies according to Exam Pattern and Selection Criteria. Aspirants may download Tamil Nadu PSC Exam Syllabus 2018 either from here or from the official website. The Selection Process will take place on the basis of written examination and oral test. Candidates firstly appear in written examination. An examination consists of two paper such as Paper I and Paper II. The Paper I Contain question-related to General knowledge and Aptitude & Mental Ability. And Paper II Contain subjective questions. Participants who qualify in written examination will participate in an Oral Test. Final Merit list should be created on the basis of overall marks. For Performing well in examination applicants may require TNPSC Draughtsman Syllabus 2018. Participants may check here Tamil Nadu PSC Exam Syllabus 2018 from below section. Candidates who are participating in Draughtsman exam it may helpful for them. Here we also provided you links to download Draughtsman Exam syllabus 2018. History and Theory of Architecture. Computer Aided Drafting and Visualizations. concepts of E.Howard, Patric Geddes, C.A.Perry. Parks, Play Grounds and Open Spaces. Constructions Materials and constructions Practice. Participants who want to perform well in the examination may check here Draughtsman Exam Syllabus 2018. Candidates should follow these steps to download Tamil Nadu PSC Exam Syllabus 2018. Participants should log on to the official website of Tamil Nadu PSC i.e tnpsc.gov.in. Candidates may search for TNPSC Syllabus section at Homepage. After that Read complete exam syllabus carefully. Applicants may do their preparation according to exam pattern given in it. Conclusion: Tamil Nadu Public Service Commission has issued notification Draughtsman Posts. Candidates who are participating in the examination may download TNPSC Syllabus 2018. An examination will take place on 03.02.2019.